July’s full moon is known as the Full Thunder Moon. The name is thanks to the frequency of thunderstorms during this hot month, and I think it’s the perfect symbol for the thunderous emotions we can experience as women…especially premenstrually or during the two-week wait. For our Full Thunder Moon live cast on Wednesday August 1, we are going to embrace the storm. Have you had a good ugly cry lately? Maybe you burst into tears for no discernible reason, or had an emotional meltdown over something that should have been no big deal? Instead of feeling bad about yourself, how could you embrace this explosion of emotions? There’s a lot of emotion wrapped up in being a woman, especially as it relates to our periods, fertility, and reproductive health challenges like PMS, endometriosis, PCOS–challenges that may have brought you to the Yoga Goddess community in the first place. In the fertility world, we talk about the emotional rollercoaster of the two-week wait (the period of time after ovulation and before you can accurately test for pregnancy). And whether or not you’re trying to conceive, you’re probably familiar with PMS, which can rear its head in that same premenstrual stretch after ovulation and before menstruation. What you may not know about these two weeks post-ovulation and pre-menstruation is that it’s the time of the month when your psyche is trying to speak to you. It can happen through inexplicable waves of emotion or lightning flashes of insight. But oftentimes we’re so focused on trying to force ourselves to be “normal” that we push away these uncomfortable emotions. In preparation for the Full Thunder Moon, think about what kind of emotional thunder-and-lightning your premenstrual time is offering you. Can you feel a flash of insight on your horizon? These don’t always come with a warning, but there are often darkening skies and a distant rumble beforehand. What area of your life is crying out for renewal or transformation — and maybe your premenstrual discomfort is a sign that the old way isn’t working for you anymore? Think of an uncomfortably humid summer day and the relief of a rainfall that transforms the atmosphere. Are you feeling the need to let loose the anger, fear, or hurt you’ve been holding in? If your emotional needs are being neglected, whether in the stress of infertility or the go-go-go responsibilities of day-to-day life, accept the Thunder Moon’s invitation to make some noise: joyful, angry, or both. Get out under the moonlight with a pair of cymbals (or pot lids!) and go crazy. We’re meditating with the July full moon a wee bit late this year, because during the actual full moon I’m in Calgary helping out with Miranda Gray’s Moon Mother training. I know I’ll return full of womb + moon inspiration, ready to share it with you! 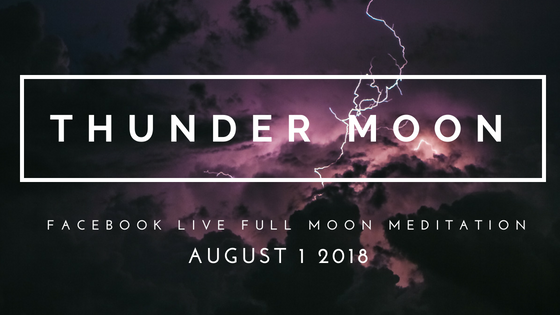 ==>>Tune in with me live on Facebook Wednesday, August 1 at 5:45 pm EST / 2:45pm PST / 10:45pm BST (British Summer Time) to meditate with the Thunder Moon. See you on the live cast!